Most are familiar with mozzarella cheese. It is the cheese traditionally used on pizzas and to make fried cheese sticks. There is quite a difference in flavor and texture between fresh mozzarella and processed sliced or shredded mozzarella, and well worth your time to find out more. It is easy to make homemade mozzarella cheese, and it can be used in a variety of recipes, including salads, meats, poultry, seafood, and vegetables. Fresh mozzarella cheese balls are sold in a brine, whey or water solution which helps them retain hydration and shape. It is smooth, mild, and slightly sweet/sour with a distinct milk flavor. The texture is creamy and much softer than mass-processed mozzarella. True buffalo mozzarella is much superior to any made with cow's milk and is highly prized around the world. Small balls (about one inch in diameter) of fresh mozzarella marinated in plain or herbed olive oil are called boconccini. Smoked mozzarella is known as mozzarella affumicata. Manteca is fresh mozzarella molded around a piece of butter. Mozzarella rolls can be found with fillings of olives, prosciutto, Parma ham, sun-dried tomatoes, and any variety of herbs. The simplest and most enjoyable way to eat fresh mozzarella is with sliced fresh tomatoes, basil leaves, and a drizzle of olive oil. 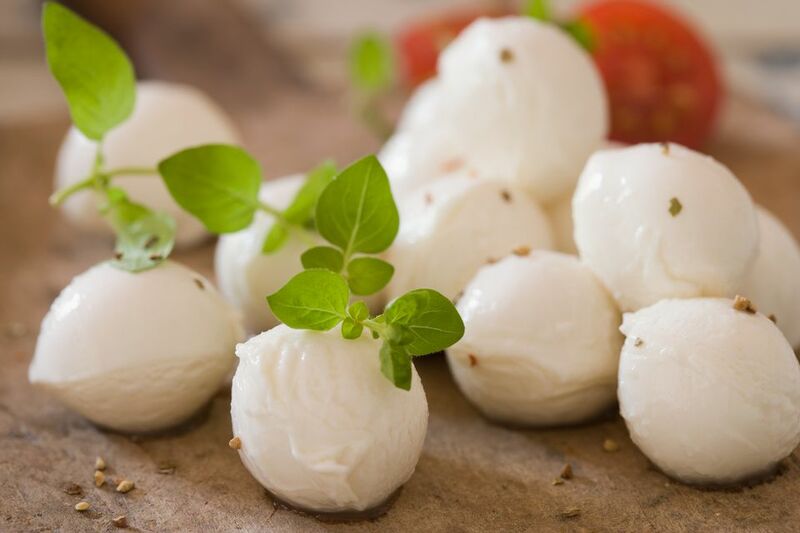 Due to expanding demand for fresh mozzarella, it can easily be found in most commercial grocery stores and Italian markets. Keep fresh mozzarella in its liquid bath until ready to eat, and eat it within 2 to 3 days. Check the product dating and buy the freshest you can find, preferably the same day. It becomes bitter and sour with age. Freezing is not recommended. Mass-produced mozzarella cheese is drier, less flavorful, and has a rubbery texture, bearing little resemblance to its fresh counterpart. It is a firm cheese that melts easily which makes it best used as a binder for sauces, for melted toppings, and in baked dishes. You will find it readily available in part skim, low-fat, and non-fat versions, most commonly pre-sliced or shredded. Keep it tightly wrapped and use within 2 to 4 weeks.